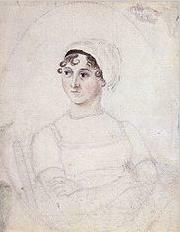 Jane Austen was born in 1775. She was the daughter of George Austen and Cassandra Leigh. English Author. Jane Austin was well educated and began writing at a young age. Though she wrote with a man's alias, many of her novels, which include Pride and Prejudice and Emma, have become widely popular. Married Name Her married name was Austen. Cassandra Leigh married George Austen, son of William Austen and Rebecca Hampson. Rebecca Hampson married William Austen, son of John Austen. Married Name Her married name was Welch. Marie Lula Lane married Mark Anthony Welch, son of (?) Welch and Nancy Jane Aldridge. Name Variation Anne Agnes Almy was also known as Ann. Name Variation Anne Agnes Almy was also known as Annis. Married Name Her married name was Greenaway. Anne Agnes Almy married Robert Griffin. Anne Agnes Almy was born on 26 February 1627 at Dunton-Bassett, Leicester, England, also reported as Leicestershire, England. She was the daughter of William Almy and Elizabeth Audrey Barlowe. Anne Agnes Almy married Major John Greene Jr., son of Doctor John Greene and Joanne Tattershall, in 1648 at Warwick, Kent, Rhode Island. Anne Agnes Almy died on 6 May 1709 at Warwick, Kent, Rhode Island, at age 82 also reported as May 17, 1709. Anne Agnes Almy had eleven children, Deborah Greene was the first, born Aug. 10, 1649 children. She immigrated with William Almy in 1635 at ship: Abigail, Lynn, Massachusetts; Family Members: Wife Awdry 32; Child Annis 8; Child Chri 3. Children of Anne Agnes Almy and Major John Greene Jr.
William Almy was born in 1601 at Belinden Parish, Kent, England, also reported as Leicestershire, England. He was the son of Christopher Almy and Joan Anne Clarke. William Almy married Elizabeth Audrey Barlowe, daughter of Stafford Barlowe, on 17 July 1626. William Almy died on 28 February 1677 at Portsmouth, Newport, Rhode Island, also reported as 23 Apr 1677. 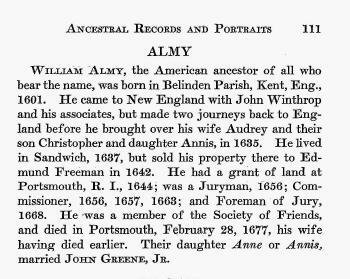 William Almy immigrated in 1635 to ship: Abigail, Lynn, Massachusetts, Family Members: Wife Awdry 32; Child Annis 8; Child Chri 3. Christopher Almy was born in 1632. He was the son of William Almy and Elizabeth Audrey Barlowe. Christopher Almy died in 1713. Christopher Almy immigrated with William Almy in 1635 at ship: Abigail, Lynn, Massachusetts; Family Members: Wife Awdry 32; Child Annis 8; Child Chri 3. Married Name Her married name was Morris. Elizabeth Almy married (?) Morris. Elizabeth Almy was born in 1663. She was the daughter of Christopher Almy. Elizabeth Almy died in 1712. (?) Morris married Elizabeth Almy, daughter of Christopher Almy. Richard Morris was born in 1690. He was the son of (?) Morris and Elizabeth Almy. Richard Morris died in 1763. Sarah Morris married (?) Burdg. Sarah Morris was born in 1735. She was the daughter of Richard Morris. (?) Burdg married Sarah Morris, daughter of Richard Morris. Jacob Burdg was born in 1743. He was the son of (?) Burdg and Sarah Morris. Jacob Burdg died in 1797. Jacob Burdg was born in 1783. He was the son of Jacob Burdg. Jacob Burdg died in 1862. Oliver Burdg married Jane M. Hemingway, daughter of (?) Hemingway and Hope Malmsbury. Oliver Burdg was born in 1821. Oliver Burdg died in 1908. Married Name Her married name was Milhous. Almira Park Burdg married (?) Milhous. Almira Park Burdg was born in 1849. She was the daughter of Oliver Burdg and Jane M. Hemingway. Almira Park Burdg died in 1943. (?) Milhous married Almira Park Burdg, daughter of Oliver Burdg and Jane M. Hemingway. Married Name Her married name was Nixon. Hannah Milhous married Francis A. Nixon. Hannah Milhous was born in 1885. She was the daughter of (?) Milhous and Almira Park Burdg. Hannah Milhous died in 1967. Francis A. Nixon married Hannah Milhous, daughter of (?) Milhous and Almira Park Burdg. Richard Milhous Nixon was born on 9 January 1913 at California. He was the son of Francis A. Nixon and Hannah Milhous. Richard Milhous Nixon married Thelma Catherine Ryan on 21 June 1940 at California. Richard Milhous Nixon died on 22 April 1994 at New York at age 81. 37th President of the United States of America. 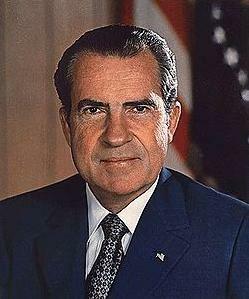 Richard Milhous Nixon was the first U.S. President to resign from office. His resignation came from impeachment caused by the Watergate Scandal. Married Name 21 June 1940 As of 21 June 1940,her married name was Nixon. Thelma Catherine Ryan died on 16 March 1912 at New Jersey. She was born on 16 March 1912 at Nevada. She married Richard Milhous Nixon, son of Francis A. Nixon and Hannah Milhous, on 21 June 1940 at California. Married Name Her married name was Carr. Phillippa Greene married Caleb Carr. Phillippa Greene was born in 1658. She was the daughter of Major John Greene Jr. and Anne Agnes Almy. Phillippa Greene died in 1708. Caleb Carr married Phillippa Greene, daughter of Major John Greene Jr. and Anne Agnes Almy. Caleb Carr was born on 23 August 1657. William Carr was the son of Caleb Carr and Phillippa Greene. William Carr died in 1703. Married Name Her married name was Bailey. Elizabeth Carr married (?) Bailey. Elizabeth Carr was born in 1690. She was the daughter of William Carr. Elizabeth Carr died in 1735. (?) Bailey married Elizabeth Carr, daughter of William Carr. Married Name Her married name was Crippin. Elizabeth Bailey was the daughter of (?) Bailey and Elizabeth Carr. Elizabeth Bailey married (?) Crippin. (?) Crippin married Elizabeth Bailey, daughter of (?) Bailey and Elizabeth Carr. Married Name Her married name was Staton. Catherine Crippin married (?) Staton. Catherine Crippin was born in 1720. She was the daughter of (?) Crippin and Elizabeth Bailey. (?) Staton married Catherine Crippin, daughter of (?) Crippin and Elizabeth Bailey.